Grotto of the Luminous Mysteries - St. Stephen, Martyr Catholic Church Merrillville, IN. In 2003, Pope, now Saint John Paul II gave the Church a new set of Mysteries to the Rosary known as the Luminous Mysteries. Fr. Mike’s brother, Larry (who lived several years at the Rectory until his marriage) with the help of their other brother, David, who were both landscapers, erected the first and perhaps only Grotto to the Luminous Mysteries. It consists of two connected pools that represent the Dead Sea on the South and the Sea of Galilee to the North with the connection representing the Jordon River, where Jesus was baptized by John the Baptist. The First Luminous Mystery incorporates our transition from death to life with God in our Baptism initiated by Jesus’ own Baptism. The Second Luminous Mystery was Jesus’ first miracle of changing water into wine at the wedding feast at Cana. This is represented by waterfalls on the left side moving from the upper white rocks to the lower red rocks. The Third Luminous Mystery is the Proclamation of the Kingdom of God by Jesus by the means of Parables along the seashore and on the mountainsides. 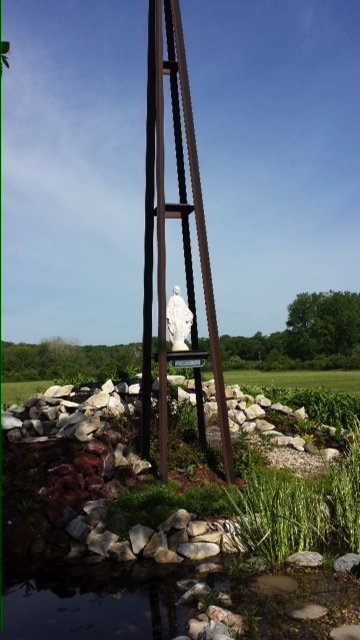 This is represented on the hillside, where the front part incorporating the cross and the statue of the blessed mother above represents the first parable of the sower of the seed. Notice the footpath, the rocky soil, the thorn bushes and the good soil of flowers (thirty, sixty, and a hundredfold). The back side is filled with various plants as the lilies of the field representing the thousands of people who would hear those words and in their trust would come to understand that kingdom and live it. The Fourth Luminous Mystery is the Transfiguration of Jesus on the top of Mount Tabor. That is represented in stone, where Jesus is the stone rejected by the builders that would become the cornerstone of the structure in his death and resurrection being foretold to Peter (the Rock), James, and John (the Pillars). Jesus would appear with Moses (the two tablets of the 10 commandments) and Elijah (the rebuilt altar in his face off with the 450 false prophets). The Fifth Luminous Mystery is the Institution of the Holy Eucharist. This is represented by the cascading waterfall on the right over the red rocks lined by the white rocks indicating Jesus’ body broken and blood poured out for our salvation. During the warmer months (May – November) on the first Saturday, the living rosary is prayed by those standing on the larger beads (the Our Father) or the smaller beads (the Hail Mary). Also during the month of the Rosary (October), the same is done on a particular Evening (either Tuesday or Wednesday) concerning various pro-life issues.